Today is Leap Day, which in my opinion is the froggiest of days. 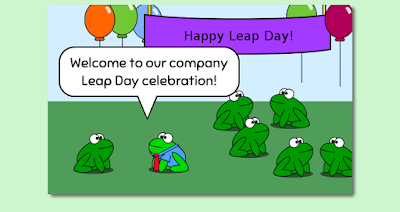 As such, the frogs in my webcomic are celebrating with an office party. I, however, am working like a normal person today. This is my 10th leap day, but the first one since I've been writing the comic. The next one will come around in 2020 and by then I may have stopped writing the comic...so this might be the only chance the frogs will have to celebrate. I've been thinking about Leap Days quite a bit this weekend, and I've decided that I don't care for them. The reason for having them is that the Earth actually completes a rotation around the sun in 365 days, 5 hours, 48 minutes, and 45 seconds. Those extra 5.8125 hours add up, so every 4 years we add 1 day. But really, 5.8125 x 4 = 23.25. By adding 24 hours when we really only need 23 hours and 15 minutes, we end up with an extra 45 minutes every 4 years and over the span of 32 leap years that adds up to a whole extra day. So on century marks that aren't divisible by 400 (such as 1700, 1800, and 1900) we don't add the leap day even though they are divisible by 4 and we're pretty much back on track. Except those numbers aren't quite exactly perfect and we'll still be off by a day every 3,300 years. It hasn't happened yet, but if humans are still around by the time it does, people are going to be really confused. I would like to propose a simpler solution. We eliminate Daylight Savings Time and just add those 5.815 hours in throughout the year in the middle of the night. You go to bed some nights and you get just a little extra sleep because your clock adds on a few minutes for you. Like 2:00 AM sticks around for 5 minutes or so. No one will notice. Sure, your watch might be off "official time" the next day but you probably won't even notice. Who really notices 5 minutes? And since everyone has smart watches now, they'll adjust themselves right along with it and no one will be the wiser. You only need a watch with 3 "times" on it anyway. Wake up. Eat. Go to sleep. All these hours and minutes and seconds are just not necessary. Let's keep things simple.